Glass cutting is a delicate process. One wrong move and the glass could be broken and ruined. Use the wrong cutting tool, and the risk for damage goes up, and your edges may turn out uneven. The best way to avoid these problems? Waterjet cutting. One of our specialties here at Hydro-Lazer, our high-powered waterjets are extremely effective at glass cutting. Here are a few reasons that waterjet is the perfect tool for glass cutting. One of the great benefits of waterjet is its versatility, able to cut through glass both thick and thin. Everything from stained glass, to touch-screen panels and even glass walls, can easily be cut with a waterjet. Few tools offer a cleaner, smoother cut than waterjet cutters. Rather than an abrasive material, the highly pressurized water splits the material cleanly, and simultaneously polishes the edge, preventing ragged edges. Short of laser cutting, there aren’t many cutting techniques that can match waterjet for precision. The single cutting point allows highly detailed cuts to be made, even at small sizes, and holes are no problem since the cutting “blade” can effectively be turned off at will. 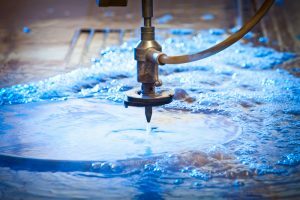 There are myriad applications for waterjet cutting, and glass cutting is just one of them! If you need a glass project cut, or if you have another cutting project you think might benefit from waterjet cutting, contact us today with your ideas!